Typical Applications include treating drinking water from wells, boreholes, springs & other untreated supplies. Can be installed within a water treatment system before point of use and for recirculating loops and high purity water systems. Inside the stainless steel chamber runs a sleeve made of special quartz glass transparent to UV rays and a UV lamp inside this. The sleeve is sealed into a chamber at each end creating a water jacket around the lamp. Water to be treated enters the chamber at one end and exists at the opposite end. As the water passes through the chamber it is exposed to the ultraviolet rays and micro-organisms are killed. 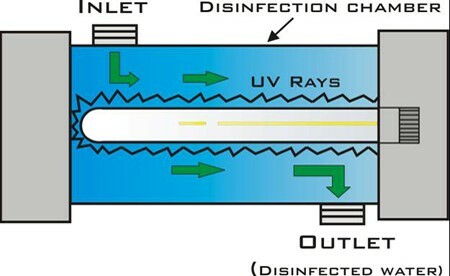 In private water supplies the UV system is the last part of the treatment system. A sediment filter is normally fitted just before the UV, this stops particles getting through to the UV, behind which bacteria can hide.